Passing through a gate there seems to be something wrong. The river is clearly on my right and continues straight ahead for some distance and yet to my left, among the woodland greenery, stands a fine medieval river bridge. What is going on? What has been going on is that throughout my journey through Abingdon I was not following the natural course of the river. From the leaving the remains of the old Swift Ditch Lock I have been following a channel cut by the monks during the middle ages. (Monks seem to have carried out a lot of the work on the upper Thames; their life was obviously not restricted to vespers and cloisters as is so commonly assumed). 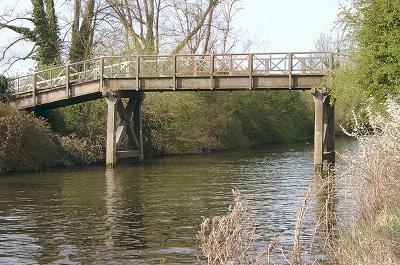 The bridge I can see is Old Culham Bridge, which now only crosses the Swift Ditch and not the major navigation channel. Its original purpose is no longer served and so it is allowed to while away the years in sleepy semi-retirement. Sadly Swift Ditch is not to be found on the present day Ordnance Survey map. At some point in time it has been “re-branded” and now parades itself as “Back Water”, a name that seems to invoke a more downmarket response than its predecessor. The river continues ahead and twists its way through Sutton Pools, a series of ponds that lie between the main river and the picturesque village of Sutton Courteney. My path takes a ninety degree left hand turn and follows the Culham Cut, a cutting made at the start of the 19th century and opened in 1809 at the same time as Culham Lock. The original need for the cut was a mixture of ease of use and economics. The natural route for boats through Sutton Pools involved a lot of difficult manoeuvring, but also involved encountering a lock situated beside a mill. This lock, as a consequence of the effect of the pools, took a great deal of water to fill it, and so was costly in both time and money. Controversy was the order of the day with merchants and barge owners not at all happy about the high tolls charged by the mill owner. The Thames Navigation Commission made many unsuccessful attempts to reconcile the differences, but the complaints continued to pour in and they finally commissioned the construction of the new lock at Culham and made a cutting to bypass the contentious pools. This made everyone happy again. Well, almost everyone, because the miller was not happy one little bit. He had lost all of the revenue from his tolls. The village of Culham has a lovely village green and Victorian church. 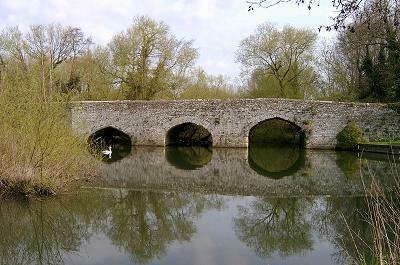 In earlier times it gained importance when it became the main wharf for the transportation of stone from the demolished Abbey at Abingdon to be re-used for buildings in London. Engineers have taken another loop out of the river by digging the Clifton Lock Cut. Following the great success of the Culham Cut, the Navigation Commission repeated the same trick a little further downstream at Clifton. Instead of following the natural course that twists through the village of Long Wittenham I am able to continue my steps in a steady curve along the Clifton Lock Cut. Shortly after I have passed by the lock the river starts to bend the other way and one of the most beautiful “chocolate-box” scenes along the whole river slowly reveals itself.